So much has happened over the last few weeks. I feel as though I am bursting with things to say! I will start with what an incredible month June was! It was the first official CMV awareness month and was filled with lots of new and wonderful things. 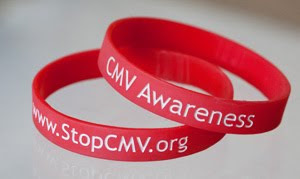 I was able to tell a lot of people about CMV, what it is and how easy it is to both catch and prevent. Janelle, The president of STOPCMV.ORG, and other CMV mothers made strides while in Atlanta at the CDC. Hope, is something that is running rapid in our CMV community! On the charity note, March of Dimes is starting to go full force as well. I am working close with my coordinator Mary to put the finishing touches on planned fundraisers. So far this year we are having a Premier Designs fundraising party, a car wash, and I am in the works for planning either a festival for fall or spring. I have also talked with the FBLA teacher advisor for PHS and they are going to be doing a fundraiser for us and I am going to meet with Dr.Wilson, the principal of Hill City Elementary, to organize penny walks for all the students. It's very exciting to see how willing people are to get behind an important cause. Mary and I are also putting our heads together on ways to incorporate Addison's CMV as a HUGE part of everything we do. We both want to be able to use this huge forum as a way to make a BIG impact and difference! Now of course we can't forget the little one behind all of this motivation! 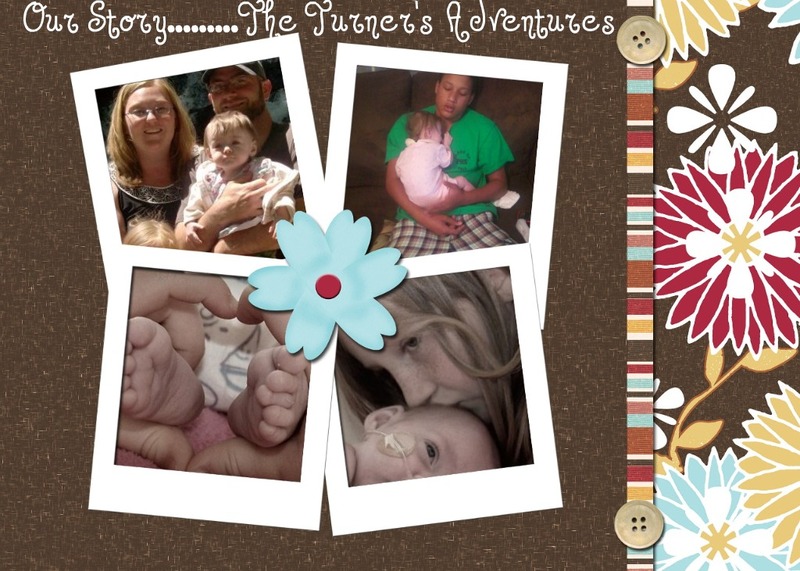 The month was filled with a lot of progress and firsts for our little fighter! She was fitted for and brought home a head-shaping helmet, got two teeth, learned how to pivot, is eating more table foods(and keeping them down), is talking like crazy, pulling herself up on anything her short arms are able to reach and showing preferences over people, colors and shapes! It's been wonderful to watch her explore every little detail of a toy, to stare at a picture taking in all it has to offer and taste ANYTHING she can get her hands on, not that has been always a pleasant experience for any of us! I believe Chloe and Trey may have gotten the worst end of that from time to time....hehehe. I have never seen such instant love between siblings before. Trey is the alpha, of course, and protects both of them with such conviction. Sometimes I stare at him in complete amazement, that young man has had some very adult things to deal with, but has dealt with it like a champ. He knows what he wants, and even though at times it takes a bigger push than others, he does the right thing. I will never be able to find the words to thank him for everything he has taught me and for the way he shows unconditional love towards his "sisters". Chloe says the sweetest things about him! She was telling my mother and aunts on the way to my mother's wedding, that "Trey's probably over there being very polite to everybody, he's so polite and he's not my cousin, he's my bubba. He protects me from everything, he will shoot the coyotes in the backyard for me and everything. ", and no there aren't any coyotes in the backyard or has Trey ever shot a gun, but for Chloe that is who he is. He's the hero big brother, standing tall willing to take on any scary monster for her, just like her daddy! This family of mine has grown in ways I never imagined! I have the four most beautiful and loving people living in my house. My old friendships have grown and become more like sisters than friends, my mother has met and married the love of her life, and I met so many new and wonderful people, the kind of people who truly enrich your life! For all of these reasons, I will continue to be strong, I will continue to embrace what life has in store for me, and I will continue to live intentionally! God may not do all the work for us, but he gives us all the tools, resources and people we need to make the best life. So when I have a day with 3 hours of sleep, a baby who is throwing up all over me, screaming for hours on end, a seven year old that says"But MOMMY!" and fifteen year old who won't stop saying,"I'm borrrreeeedddd" I will refer back to this blog. The one that shows me proof that "This to shall pass!" When I first sat down to write this blog I fully intended for it to be a full on rant, but now as I am typing I can't seem to find those words. Don't get me wrong I am still irritated by those people who take advantage of others, those who lie to get ahead, those who judge without knowledge of what that person is going through and people who refuse to accept responsibility for their own actions. It just seems pointless to allow myself to get to the point of ranting, even with so much too rant about. I feel as though I have more to be happy about. Chloe is getting better and better about doing her chores. She is becoming the big sister I had dreamed she would be and as I weed out the bad influences in her life I am seeing change after change. Trey is doing extremely well, considering all of the obstacles he has had to overcome. It seems no matter what is thrown his way he conquers it with an amazing amount of finesse for a boy of fifteen. Then there is my little peanut, who is still continuing to climb that mountain with very little complaining! Me on the other hand, I feel I could take a lesson or two from my babies! They are so good at just letting it all just roll off their backs and believe that tomorrow will be full of promise and rainbows. I miss that carefree, light-hearted approach to life. It seems as we grow older and have more responsibility put onto us that feeling goes away. I want it back! I want to stop worrying constantly about EVERYTHING. I want to be able to smile and say screw it when someone is hurtful and disappointing. How do I get back there? I have reached out to my more laid back family and friends and they all say to just roll with it. Forget about it and move on. Then I remember none of them have a family, people that count on you making the right choice. It's very hard for me to watch people lie, connive, blame others for their mistakes and in general just continue to be selfish. I don't understand those behaviors and my personality isn't the kind to just let people trample over me and those I love. To put it nicely I can be very up-front, why beat around the bush has been my recent philosophy. I don't have time to play the games. Between insurance billing, doctor appointments for three kids, keeping track of Addison's prescriptions, wrestling for Trey, cleaning house, summer reading club, March of Dimes and trying to raise awareness for CMV, my plate is full! I don't want to be nice sometimes, I want to scream and say, "What the F**K is your problem!!! Grow up!" This blog will be short, but I felt as though I had to share this moment I had with Addison today. I was upset, thinking about all of the things my little peanut has been going through. Tomorrow is a BIG day for us, we are seeing the GI doctor and there is a strong possibility that she will have to get a G-tube. As I am sitting on the couch holding her, kissing her, I start to cry. I reach up and take my glasses off and as I do that Addison lays her head on the bridge of my nose, looks up at me and wipes away my tears with her little hands and then laid her head on my shoulder. That moment was indescribable, I felt at peace. It was as if she knows it will be okay and that was her way of telling me. She reminds me everyday how strong we both are. 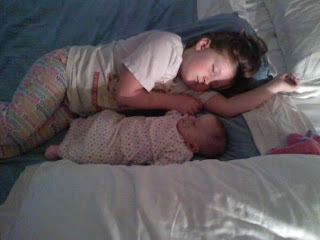 To be the mother of my two girls is the greatest honor and is truly humbling. Momma loves you girls! Now as a mother myself, my fears have changed. When Chloe was first born I was scared I would do or say something to eternally screw her up. I was scared of her falling, choking and getting sick. All of those fears in the years to come would somewhat subside as I learned how to be a mom and watched what a wonderful person she was becoming. Don't get me wrong I still have fears when it comes to Chloe, but NOTHING could have prepared for me for what was to come with Addison. 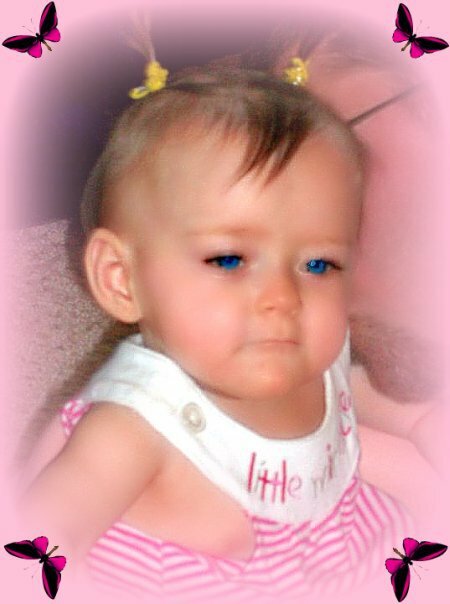 Ever since she was born there has been worry, will her organs support her, will she get an infection in her bowels, is she going to be blind, deaf , mentally or physically handicapped?With she grow to be a happy healthy child? All of these questions have been boggling my mind lately. It's possible that her scar revision surgery this Wednesday is making those fears worse. I will be completely out of the loop for two hours! I will have no idea what the doctors are doing and whether Addison is okay! To me this is scarier than any monster under the bed.....but then.....my mom bought a book for Chloe at a yard sale. "The Jester has lost his Jingle".....after reading this book I feel somewhat better. I can't really explain it, I know it was a book meant for children, but everything that book said was true! Smile at someone today, give someone you know a compliment, read a book to a child in the hospital, find whatever it is that you can do help bring back the world's jingle. For what is the point of life if we are not laughing and smiling! Trust me it works....I have been through some very painful things, scary things lately, but this Jester has no longer lost her jingle!! I will smile through the pain, I will strike fear into fear itself.......I will no longer allow my fear to dictate my life. How could I? Addison came into this world scared, in pain, and fragile. Still she has managed to fight through and smile......that illuminating smile that starts with her eyes and then moves to her mouth! If she can smile....then so shall we all!!!! I have been feeling nostalgic today. This time one year ago I was anxiously waiting to visit Addison in the hospital, with the possibility of holding her for the first time. As I look back at those pictures I can't help but cry. We have all been through so much and come so far! Addison had just battled one of the worst infections she had while in the hospital. She was on the bubble c-pap and had just finished getting a blood and platelet transfusion. She was eating 6ccs of breastmilk every three hours(which wasn't full feeds for her). She weighed 1 pound 9 ounces and was starting to really show her feisty side. I want to share with all of you my journal entry from the day after my birthday: "Alot has happened in these short 24 hours. You have another infection baby girl, but mommy knows you will pull through! They had to stop your feeds again to prevent any further infection, but don't you worry you will be eating again in no time, because unlike last time you are fighting this one off quickly! As I look at you I am AMAZED! You are so strong! God has put you on this earth to do special things little girl and I know that even when mommy isn't here with you, God is holding you close to his heart. (Wet spots on page from my tears) My life would not be complete without you in it. Both you and your big sister remind me of what endless possibilities lye ahead for all of us! I can't wait to hold you in my arms without all these tubes and to watch your sister teach you how to play dolls and wrap your daddy around your finger! Love you baby girl!" It's amazing to me that all the things I wrote have come true. Addison has continued to show how strong she is and overcome obstacle after obstacle. 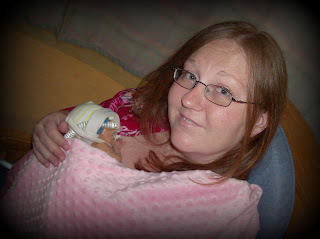 Chloe had taught her how to both play dolls and wrap her daddy and I have held my daughter with no tubes and wires! God is good! Ahhhh...I am blogging again! I never would have believed that I needed this so much, alas there are many things I would have never thought would happen that have. Which as I see it is the true miracle of life...the unexpected joy. March of Dimes, walk for babies was this past weekend. I had been looking forward to that day for months! It was everything I expected and more. I was my usual OCD self before the walk started. Making sure I had every one's shirts, answering calls to give directions and in general feeling like a chicken with my head cut off, while portraying what I hope was a cool exterior. That's me though, go go go, but I feel as though I am at my best in those situations, like it's the air that fills my lungs! I love helping others and making a difference, it fulfills that need I have to do and be something. It feels good to finally be in a place where everything, as unconventional as it may be, just fits. Watching all those people come together for a greater cause because in some way my daughter has touched their life, is an incredible feeling. Everyone was smiling, laughing, and some even dancing! ~Shout out to my best girl in the world Jess~ It was amazing to see the different dynamics between everyone, to see what the walk meant to each individual. My hope is that I will continue to be a part of this charity has well as another that has stolen my heart. STOP CMV The CMV Action Network has swept me off my feet! I have to say that even without singing me love songs and buying me flowers I am smitten. I have had an outpouring of sincere concern and warmth from everyone associate with this network! At the same time I have to admit that after reading these other stories, I feel as though I should be ashamed of myself. I have struggled so much to come to terms with being a parent of a child with special needs. That I have been angry, disheartened, lonely and at times just plain bitchy. When in reality I had so much to be thankful for.....meeting these women has humbled me. It made me realize that Addison is one of the lucky ones and instead of feeling sorry for her or myself, I need to show God just how thankful for his blessings I am. A good friend told me, that it is important to go to bed every night and tell god how sorry you are for any mistakes you made that day and ask for his help to do better tomorrow. What a honor it is to have a father who no matter how much you may curse him, will forgive with no questions asked! So be prepared world, for it is my full intention to make my mark!!! Can I get a hell yeah!? Speaking off productive ways to channel my "stuff", I am officially the Atlanta representative for STOP CMV, The CMV Action Network!! Rock on!! I am very excited to become more active in the organization and to hopefully see the day when they make CMV screening a standard test for women in their child bearing years. Great way to see our country! Great place to visit and EAT!!! My blog should explain it all!